The Kanto sub8 Powered Subwoofer is a sealed box, front-firing subwoofer that offers 250W Peak (120W RMS) of powerful bass, ideal for gaming, music, or home theatre. Whether you enjoy entertaining at home or are a music enthusiast, this powerful subwoofer is the perfect addition to any audio setup. Bring your gaming experience to the next level! Upgrade your console or PC and surround yourself with sound with the sub8 Powered Subwoofer. Its acoustic MDF enclosure is engineered to reduce undesired tones and echo inside of the box, providing a clean, deep sound that lets you feel every heart-pounding explosion and thunderous rumble. The sub8 has user-friendly controls to let you easily tune the volume and cut-off frequency of the speaker. These dials offer exacting and responsive control in order to shape your bass to fit any room. While designed to be a perfect match with Kanto speakers, the sub8 features stereo inputs that can be used with any source. Easily connect your vintage stereo receivers or your high-end speakers with a sub output for extra bass. Showcase your personal style by choosing from the four professional-looking colors: Gloss Black, Gloss White, Matte Black and Matte Grey. 8" PAPER CONE DRIVER - The Kanto sub8 Powered Subwoofer has an 8" paper cone driver, providing true bass reproduction with a low end that has real weight. The paper material provides a combination of stiffness and low mass in order to create the best sound possible. Feel the pounding bass all across the room! HIGH-QUALITY SOUND - This sealed box, front-firing subwoofer features a class D amplifier that offers 250W Peak (120W RMS) of powerful bass - ideal for gaming, easy listening, or building a complete surround sound home theatre. Its acoustic MDF enclosure is engineered to reduce undesired tones and echo inside the box, providing clean, deep sound. EASY TO USE CONTROLS - The sub8 provides exacting and responsive control that lets you shape your bass to fit any room. With precision dials to let you easily tune the volume and cut-off frequency, this powerful subwoofer can be easily tweaked for an optimal audio experience. 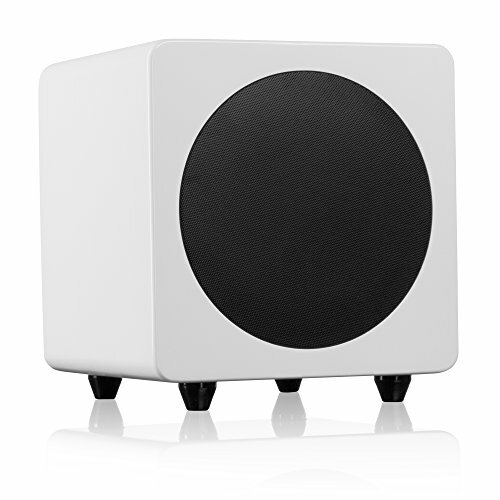 MODERN DESIGN - The Kanto sub8 powered subwoofer comes in four professional-looking colors. Choose between Gloss Black, Gloss White, Matte Black and Matte Grey to suit your personal preference. The sleek design fits in with any modern home theatre system and looks great on its own. STEREO INPUTS - While the sub8 is designed to be a perfect match with Kanto speakers, this 250W Peak (120W RMS) powerhouse features stereo inputs that can be used with any audio source. Easily connect your vintage stereo receiver or any high-end speaker with a sub output to add all the bass you need.